To ensure the best possible clinical outcomes for arthritis patients, it is essential that they be seen early and treated appropriately at the earliest opportunity. Early therapy has proven much more effective than that given late. 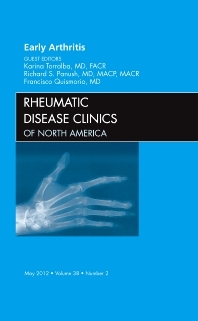 This issue of Rheumatic Disease Clinics of North America brings the rheumatologist up to date on the latest treatments and interventions in evolving arthritis and established early arthritis. Topics covered include early rheumatoid arthritis, psoriatic arthritis, undifferentiated arthritis, oligoarthritis, osteoarthritis, and others. Imaging modalities are addressed as well as various contemporary treatments including biologics.